Download the new IFG printable flyer here! 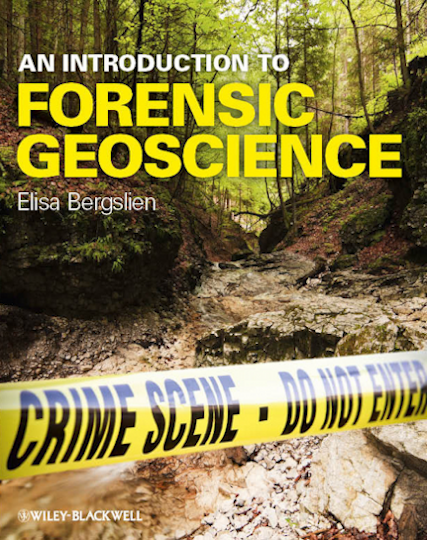 Forensic Geology: Ethics, Communication, Regulation and Opportunities. 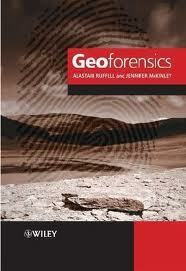 human remains, sensitive and confidential data and case intelligence. Silvia Peppoloni, Giuseppe Di Capua. 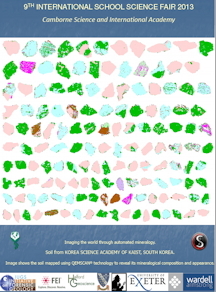 The complete abstracts with program is now available. 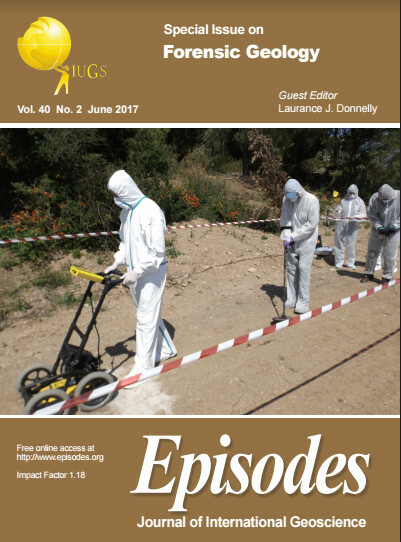 Visit http://www.episodes.org/journalArchiveArticle.do to see the full issue. 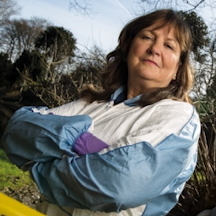 Ruth Morgan has been conferred with the title of Professor of Crime and Forensic Science at UCL, the first chair in Forensic Science at UCL. It is recognition of internationally leading research, excellence and innovation in teaching, developing channels for knowledge transfer and for service to the academic and stakeholder communities. 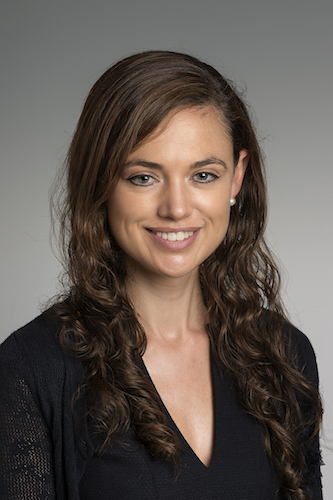 IFG congratulates Dr. Morgan on this will deserved promotion. The YPs would like to invite you to join us for the July monthly lecture. 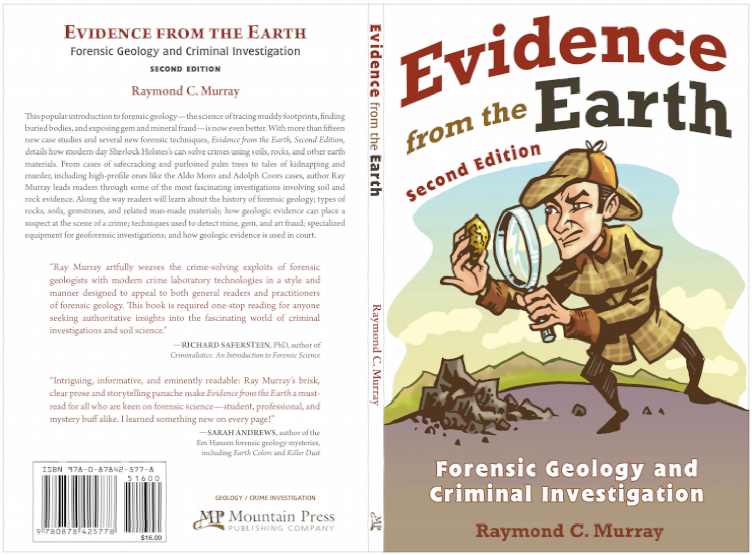 We are taking over for one month only to find out how we can use geology to fight crime! 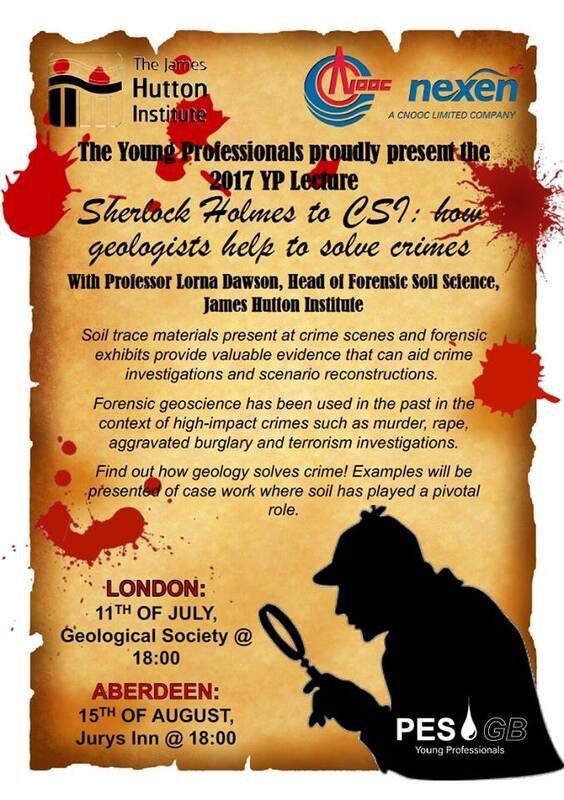 Professor Lorna Dawson, Head of Forensic Soil Science at the James Hutton Institute will be taking us on a geological murder mystery to show us how trace materials in soil can provide valuable evidence in crime investigations and scenario reconstructions. On behalf of the American University of Rome and the ENFSI Group Forensic Archaeology we are delighted to invite you to the 6th European Meeting on Forensic Archaeology (EMFA 2017) taking place from August 18-19, 2017 in Rome (Italy), organized by the American University of Rome in the beautiful venue of NH Collection VittorioVeneto (Corso d'Italia, 1 - 00198, Rome , Italy) in Villa Borghese, one of the most famous and beautiful landscape gardens of Rome. This scientific meeting will bring together practitioners, researchers and educators from around Europe and beyond who are engaged in the field of Forensic Archaeology. 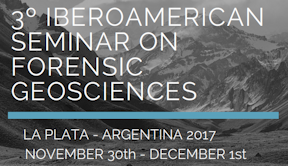 The purpose of the meeting is to discuss the current state, and further development requirements, of forensic archaeology; to present forensic case studies and R&D work (e.g. 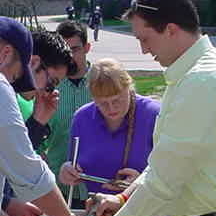 archaeology, anthropology, GIS, geophysics, human taphonomy, soil, art/antiquities crimes, etc. 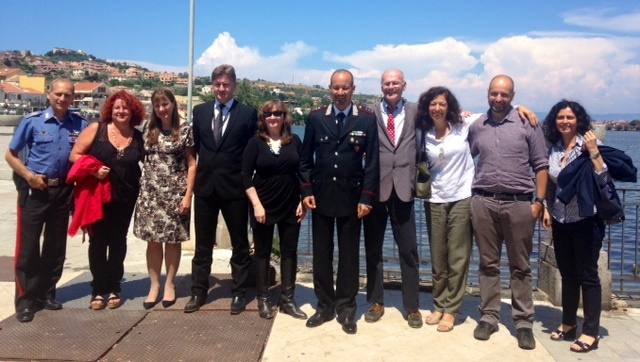 ); to meet foreign colleagues; and to inform you about the advancement of the ENFSI forum for Forensic Archaeology. 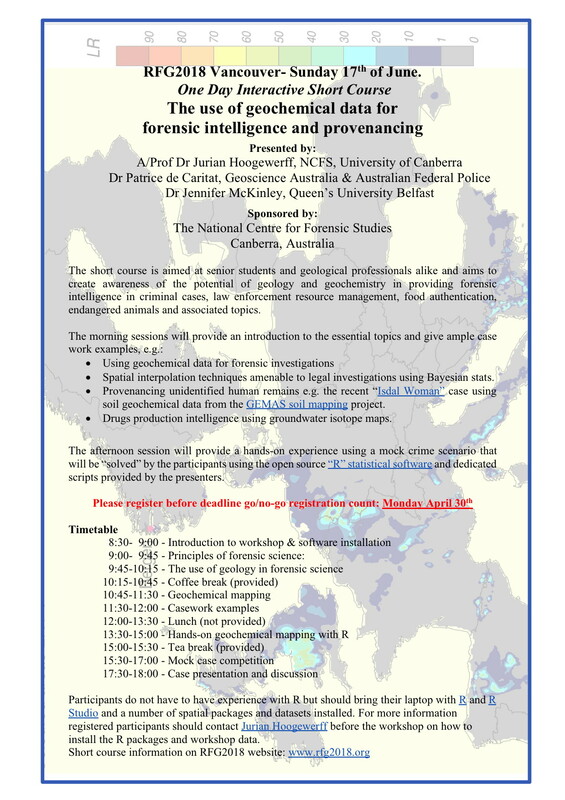 The programme for the soil forensic symposium on 29th August 2016 is now available. To register or for more information please visit the California Association of Criminalists website. Abstracts can be submitted via the Abstract Submission Form for General Session, Workshops, or Posters . All topics/disciplines welcome. General Session/Workshop presentations must be PowerPoint format. 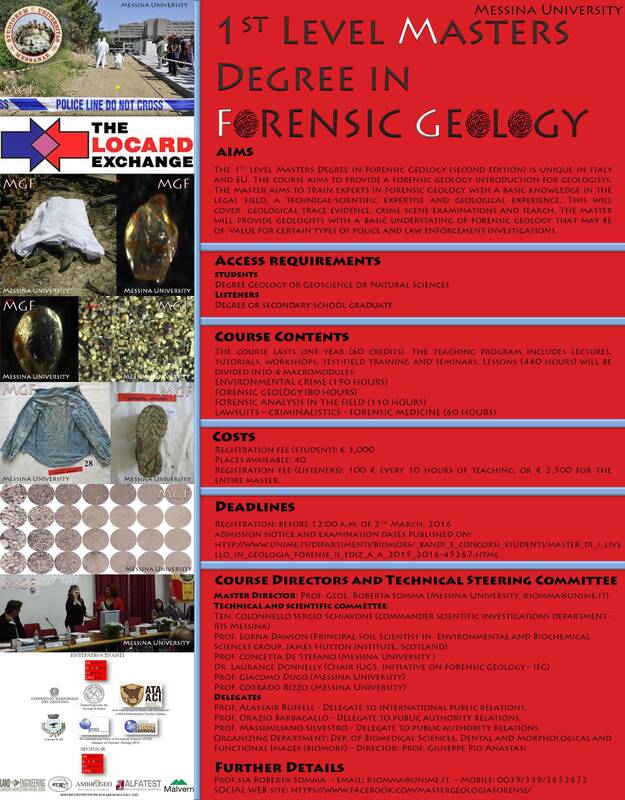 The seminar, open to students, professionals and researchers, aims to illustrate the principles of Forensic Geology, a discipline in constant development and growth, and its applications in the legal field. 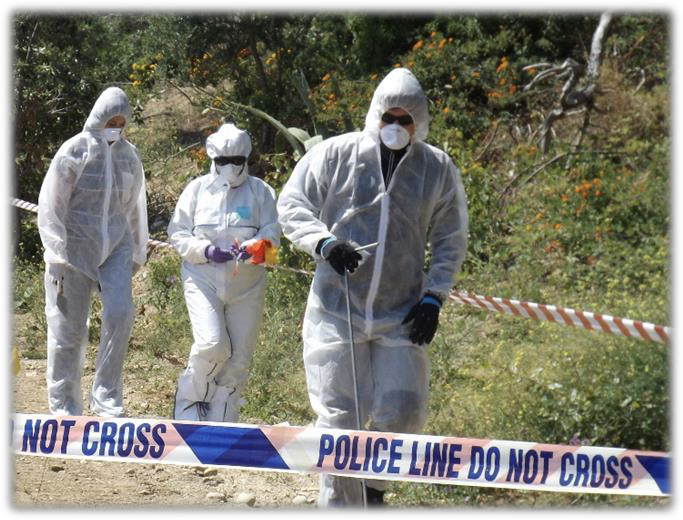 The main subjects covered are environmental crimes and crimes against the person. Attendance is limited to 100. 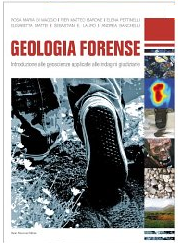 In 2014, the University of Messina established and launched a Course for the 1st Level Master degree in Forensic Geology (first edition). 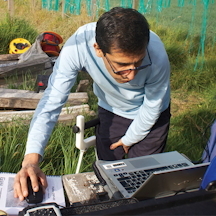 The University of Messina is the only University of the European Union to have established a first level master degree with a specialized program dedicated to geosciences applied in court cases. 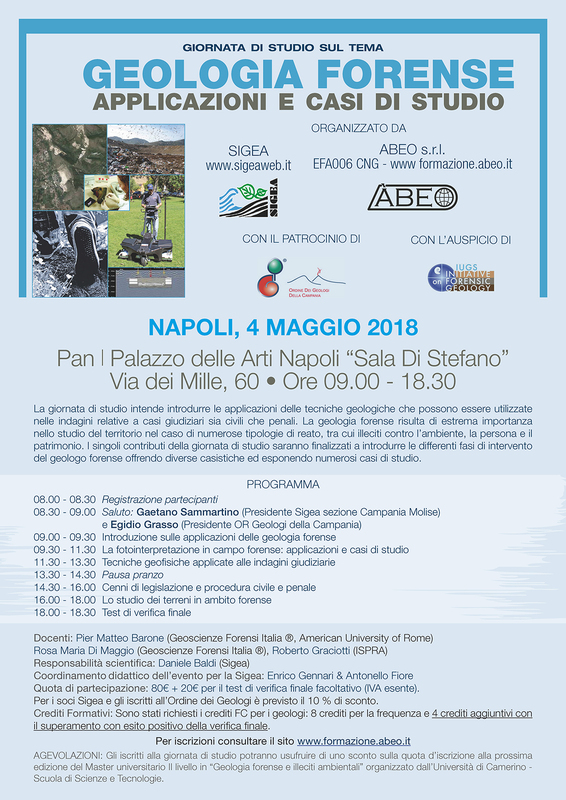 The University of Messina is now accepting application for the second edition of its 1st Level Master degree in Forensic Geology. It is a course of scientific specialization and high permanent and recurrent training, postgraduate, which allows to refine knowledge and skills on a more specific scope, so that students can enter the world of work with a more complete training. The Master is a specialization, higher educational, cyclical, and long-term course with a final First Level Postgraduate Master degree, after a final exam (Ministry Decree 22/10/2004 n° 270 “Modifiche al regolamento recante norme concernenti l’autonomia didattica degli Atenei” approved by the Decree of the Ministry of University and Scientific and Technological Research 3/11/1999 n° 509). The Master is realized due to the art. 20 of the University Didactic Rules. The program flyer in English can be downloaded here, as well as a two part the English application form Annex A and Annex B here. The full program description in English can be downloaded here as a pdf file. While the Italian program description can be downloaded here. 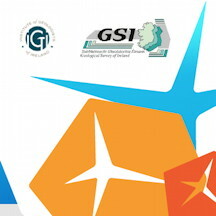 To submit abstracts: please read information on the website (http://www.35igc.org/Verso/211/Submit-an-Abstract) and follow the instructions. Abstracts can be submitted for Papers and Posters. The closing date for submissions has been extended to 29th February 2016. Acceptances of papers will be sent out by 31st March 2016. Only electronic submissions will be accepted via the IGC Abstract Submission Portal links. at the University of Messina on the first day. 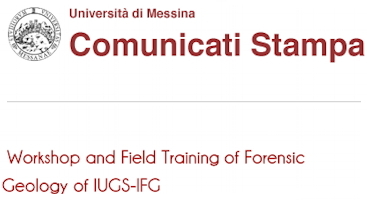 The first "Workshop and Field Training on Forensic Geology of IUGS-IFG" will be held Wednesday 10 and Thursday June 11 starting at 9:30 at the SIR "Faculty of Science and Technology" of the University of Messina. 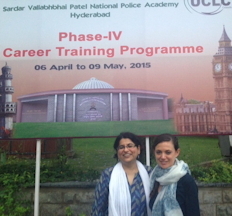 Ruth Morgan from UCL delivered training in April 2015 as part of the Indian Police Service Mid Career Training Program at the Sardar Vallabhbhai Patel National Police Academy in Hyderabad. the Indian policing context at the strategic level. Read about the amazing work of Carlos Martín Molina on Vice.com. 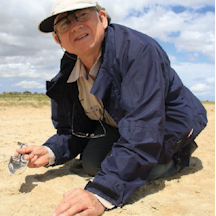 Carlos Martín Molina, a 48-year-old resident of Bogotá who is the only forensic geologist in the country. ... [He] could use these same methods to find gold or oil deposits and make good money doing it. [Instead] He has dedicated his life to looking for those whom violence has silenced. Lorna Dawson starred in a Nature News Feature! 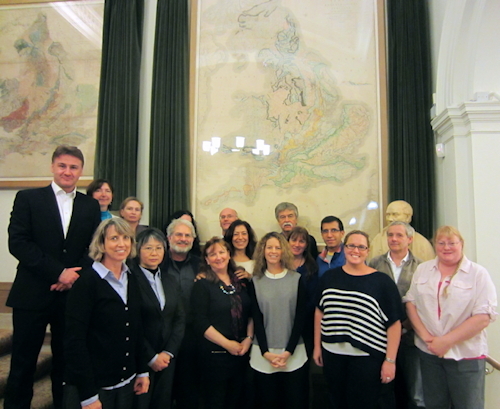 IFG members posed in front of the Geological Society of London's display copy of William Smith's 1815 geological map of England, Wales and Scotland (the one described in Simon Winchester's book The Map that Changed the World). The map further up the staircase is the one created by the Society's first President, George Greenough. Both are located at the foot of the east staircase of the Society's Burlington House location. Department of Environment, Security, Territory, Food and Health Sciences (S.A.S.T.A.S.) 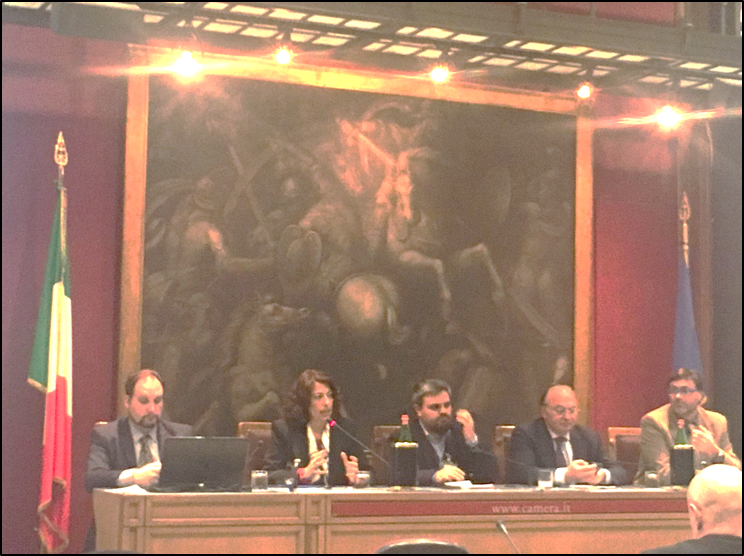 "Carmelo Abbate"
The University of Messina has established a Masters Degree (Rectoral Decree) program starting in the 2014-2015 school year. 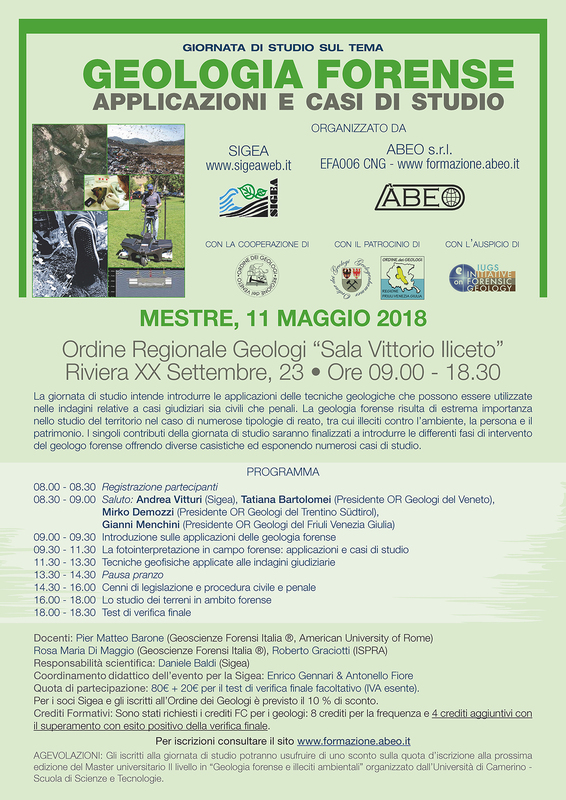 The course is being sponsored by the Italian National Council of Geologists (CNG), The International Union of Geological Sciences (IUGS) Initiative on Forensic Geology (IFG), and the Municipality of Ali Superiore (Messina) and the program is sponsored by Ambrogeo, Alfatest, and Malyern. Based on above-mentioned (and possible further) sponsors, some scholarships will be provided. The scholarships will be based both on financial incomes (ISEE) and merits. 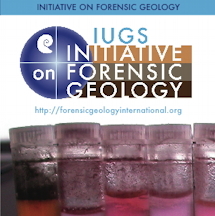 Download our 2014 full color, printable Initiative on Forensic Geology (IFG) flyer! Robert Fitzpatrick is featured in the Adelaidean! 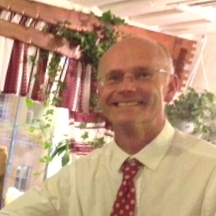 Dr Laurance Donnelly received an award of Recognition from Forensic Geoscience Group of the Geological Society of London. 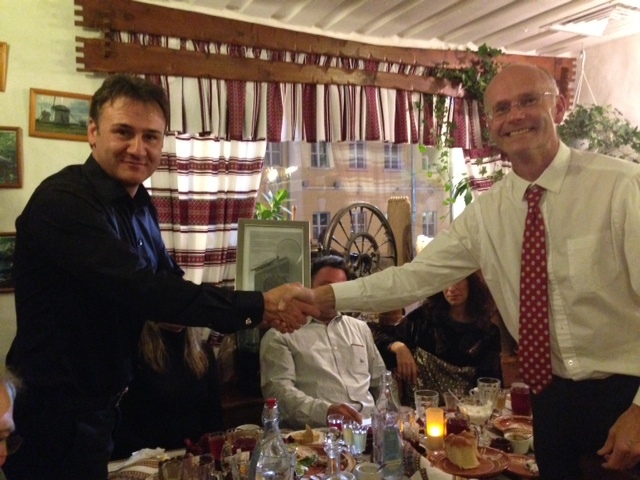 The award was presented by Alastair Ruffell, Chair of the Forensic Geoscience Group at the Moscow meeting of the IUGS IFG held on 21/10/13. 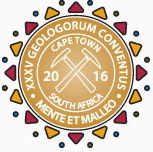 Rob Fitzpatrick gave a short speech in recognition of Laurance's pivotal role in international forensic geoscience.